DUBAI, United Arab Emirates — A contractor involved in building infrastructure around the marquee stadium for Qatar's hosting of the 2022 World Cup did not pay its workers, leaving them stranded thousands of miles from home, according to a report released Wednesday. Mercury MENA, an engineering and plumbing firm, owes thousands of dollars of wages to workers from countries where many live on less than $2 a day, Amnesty International said. Those employees helped build projects, including works around Qatar's Lusail Stadium, which will host the opening and closing matches of the soccer tournament. The company, whose website is now down and offices in Doha are shuttered, did not respond to requests for comment from The Associated Press. 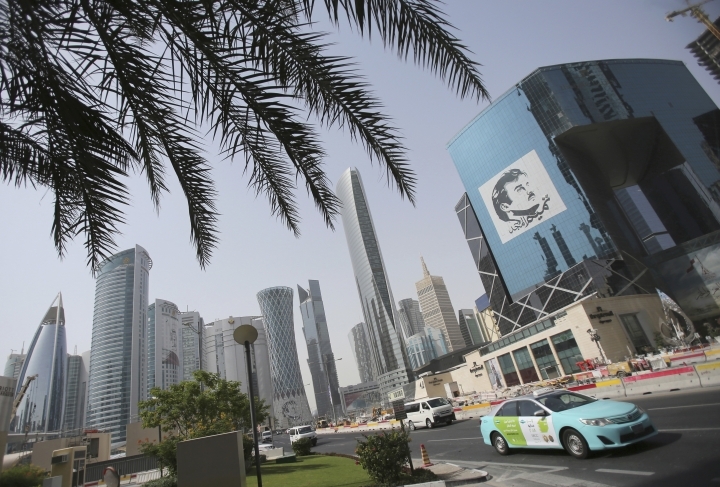 Qatar's government said it was investigating, but similar complaints involving the abuse of foreign workers have been common for years in both Doha and other oil-rich nations of the Persian Gulf. "People from all over the world cheering, laughing, touring some of the beautiful stadiums, recreational sites and hotels here... Will they ever think what are the stories behind those structures?" one worker reportedly told Amnesty. "I guess not... Blind eyes are common nowadays." Amnesty said it examined the cases of 78 former employees of Mercury MENA, interviewing 44 and analyzing documentation of another 34. Of them, 58 came from Nepal, 15 from India and five from the Philippines, Asian nations that send thousands of laborers, taxi drivers and office workers to the Gulf. Mercury MENA worked on several projects in Qatar, including work around the stadium, the new Qatar National Library and a worker's hospital and modern accommodation for laborers, Amnesty said. Workers told Amnesty that the firm owed them on average between $1,370 to $2,470, a huge sum for their families back home. It said one worker was owed nearly $25,000 after over a decade of work. Some workers found themselves stuck in Qatar without money and unable to leave the country as local laws require workers to get an exit permit supported by their employer before they leave. Earlier this month, Qatar partially ended that requirement, part of its internationally criticized "kafala" system that ties expatriate workers to a single employer. Amnesty said Mercury MENA's CEO told them in 2017 that his firm "had been the victim of unscrupulous business partners resulting in 'cashflow problems' and a number of disputes over payments with contractors and clients." In a statement, Qatar's Labor Ministry said such abuse of workers is "not tolerated" in the country and that there are unspecified "legal proceedings" against Mercury MENA. "While Mercury MENA no longer operates in Qatar, legal matters will continue and we will conduct a full investigation," the statement said. Qatar previously has faced criticism for worker conditions as it prepares to host the World Cup in this Arabian Peninsula country where temperatures rise to a humid 45 degrees Celsius (113 degrees Fahrenheit) in the summer. FIFA already has agreed to a 28-day World Cup tournament from to November to December 2022, which is already a departure from the regular mid-year schedule. A British worker, Zachary Cox, died after falling nearly 40 meters (130 feet) in January 2017 at the Khalifa International Stadium. A British coroner blamed dangerous working practices for his death. A 23-year-old Nepali worker died at Qatar's Al Wakrah Stadium project site in August. The story has been corrected after Amnesty International clarified that Mercury MENA built infrastructure around Lusail Stadium, rather than projects at the stadium itself.